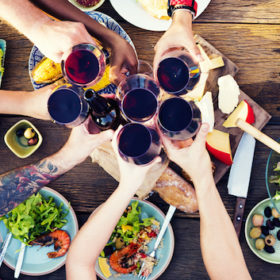 Vibrant bursts of color, fresh flavors and lively wines complement an outdoor table setting that’s equal parts playful and posh. While an inspired cocktail sets the tone, well-chilled whites and rosés reign supreme at any summer bash. Provide a range of styles and flavors to please all palates. This refreshing, big-batch cocktail, a riff on both the classic gin and tonic and a Venetian spritz, is the brainchild of “The Cocktail Guru,” Jonathan Pogash. The mixologist for Weekend TODAY in New York for NBC’s New York City ­affiliate, Pogash recommends adding ice just before serving in order to dilute the full-strength libation. Add all liquid ingredients to a large beverage dispenser. Add ½ cup each of blueberries and raspberries, saving remainder for garnish. Seal dispenser tightly and refrigerate until ready to use. When ready, add ice to container and stir well. Pour over ice into wine glasses. Float fresh berries on top, and add rosemary sprigs for garnish. Serves 20. Luke Palladino, chef/owner of Luke Palladino Hospitality Group makes sure these Italian breadsticks not only stand out on their own, but also provides a trio of ways to customize your crunch. For the ultimate bite, wrap a slice of Proscuitto di Parma around your grissini. Using dough-hook attachment of stand mixer, combine yeast and molasses with 1¼ cup warm (90°F) water. Let bloom until foamy, about 10 minutes. Add salt and oil. Gradually add flour, and mix until combined. Using hands, knead on table 10 minutes. Place dough in bowl. Let rise until double in size, approximately 1 hour. Use rolling pin to form 12-inch sheet, approximately ¼-inch thick. With a pastry/pizza wheel, cut into ¼-inch strips. Using hands, stretch evenly to fit onto sheet pan dusted with semolina flour. Let sit 30 minutes. The strips will rise and become more even in shape. Bake at 350°F for 20 minutes, rotating pan halfway through. Remove and cool at room temperature. Makes 48–60 grissini. This simple summer snack helps prove that everything is better when you add wine. Place sugar and ½ cup water in heavy stainless pot. Caramelize sugar over medium-high heat until it turns deep golden-brown color. Remove pan from heat. Add wine and mint leaves. Cook to thicken slightly, about 30 seconds. Cool and refrigerate. Once cooled, pour over sliced melon to macerate. Let soak at least 3 hours. Drain excess liquid before serving. Makes 24–32 slices. Need something to pair with the macerated melon and mint? Try this recipe for grissini (traditional Italian breadsticks) courtesy of Luke Palladino, chef/owner of Luke Palladino Hospitality Group. In this recipe, a bite of Gorgonzola plays wonderfully off the richness of figs and balsamic vinegar. Place figs, vinegar, brown sugar and star anise in saucepot with 1½ cups water. Simmer over low heat for approximately 30 minutes. Transfer mixture to blender and purée until silky smooth. It should have the consistency of honey; if too stiff, add some cool water to adjust. Set aside to cool. Spread fig jam onto grissini with a spoon. Crumble blue cheese on top of fig jam coated grissini, sprinkle rosemary on top. Wrap in prosciutto. Makes 2½ cups. Looking for something to pair with your fig spread? Try this recipe for grissini (traditional Italian breadsticks) courtesy of Luke Palladino, chef/owner of Luke Palladino Hospitality Group. Aromatic sage takes the place of traditional basil in this updated pesto, and married with a healthy helping mascarpone cheese. In saucepot, combine oils and heat to 350°F, using candy thermometer to check temperature. Lightly sauté sage in blended oil until translucent. Remove sage, and discard oil. When cool, combine sage with garlic, pecans and Grana Padano in food processor. Pulse coarsely. Season with salt and pepper to taste. Set aside. Place Mascarpone into bowl. Let stand at room temperature for 30 minutes to soften. With a rubber spatula, fold in the sage and pecan pesto. Makes 2½ cups. Need something to pair with your pesto? Try this recipe for grissini (traditional Italian breadsticks) courtesy of Luke Palladino, chef/owner of Luke Palladino Hospitality Group. In her book, Salmon: Everything You Need to Know + 45 Recipes (Chronicle Books, 2016), James Beard Award winner Diane Morgan pairs zesty salmon cakes with a bright slaw of jicama, orange and cilantro. Preheat oven to 250°F. Place salmon in a shallow baking dish. Rub with olive oil, and season lightly with salt and black pepper. Bake approximately 20 minutes, or until internal temperature is 125°F. Set aside to cool. In nonstick frying pan, melt 2 tablespoons butter over medium heat. Add ginger, onion, celery and red pepper. Sauté until soft, approximately 4 minutes. Add ½ teaspoon salt and a few grinds of black pepper. Set aside to cool. In medium bowl, combine mayonnaise, lemon juice, cayenne, thyme, chives and parsley. Mix well. Using a fork, flake salmon into small pieces. Add salmon to mayo mixture. Add cooled vegetables. Mix with a rubber spatula, being careful not to mash salmon. From salmon mixture, make 12 cakes ­approximately 1¾-inches in diameter and ½-inch thick. Place cakes on baking sheet. Cover and refrigerate at least 40 minutes; cakes may be made up to 8 hours in advance. Spread breadcrumbs on plate and coat salmon cakes evenly. Heat large cast-iron pan over medium heat. Add remaining butter and grapeseed oil. Fry salmon cakes 3 minutes per side. Transfer to plate and keep warm. Makes 12 cakes. Combine jicama, onion, oranges and cilantro in large bowl. Toss well. In small bowl, combine olive oil, lime juice, mustard, cumin, salt, sugar and a few grinds of black pepper. Stir vigorously to form dressing. Pour over slaw. Toss well. Cover and refrigerate for up to 24 hours. To serve, place mound of slaw in center of plate and top with salmon cake. Serves 12. Tangerine and mint are intertwined with Morocco. These two flavors mesh ­perfectly with the citrus and honey tones of the Prosecco, revitalizing palates at the end of a blissful summer day. Place tangerine, mint leaves and sugar in double boiler (or stainless steel bowl that fits comfortably over saucepan). Mash together until sugar melts. Remove from heat. Let cool. Place mixture in food processor, and pulse into coarse chunks (do not overprocess). Add Prosecco, lemon juice and salt. Mix well and refrigerate. When cold, transfer to ice-cream maker and process until thickened. Place in freezer to harden, or serve immediately. Serves 8.